The Activity Input Form has been optimized to increase its performance speed approximately 90 percent. In addition, the performance speed for several reports has increased 80-90 percent. We are currently working on increasing the performance speed of other reports as well – details will be available soon. Vitae can now be exported in bulk, allowing multiple vitae to be viewed in the same screen at the same time. Previously, only one vita could be viewed at a time. In the Administrative Reports section, click Standard Vitae. Select the unit containing the vitae to be exported. Click Bulk Export. The Export dialog box opens. 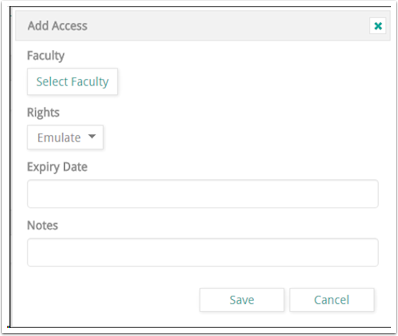 Administrators can now disable logon access to FACULTY180 for inactive faculty accounts that are not included in faculty uploads. 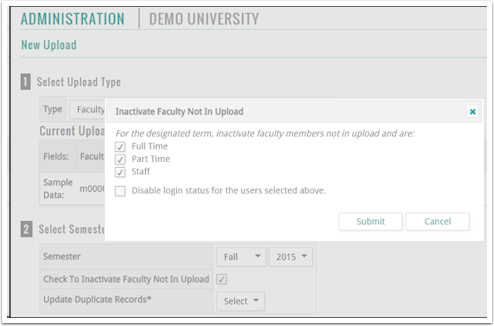 Previously, inactive faculty accounts that were not included in faculty uploads still had logon access to FACULTY180. In the Select Semester section, select the Check To Inactivate Faculty Not In Upload check box. The Check To Inactivate Faculty Not In Upload dialog box opens. Select the type of faculty accounts (based on employment status) that should be inactivated and not included in the faculty upload. A proxy user does not have access to the Admin tab or administrator functions, even if the faculty member for the account they are assigned to has this access. A proxy user does not have access to the evaluations functionality. A proxy user cannot access dashboard entries related to evaluations. Proxy access expires on a date selected by the faculty member. On the Faculty menu, click Access Settings. The Access Settings screen displays. Access Granted to My Account: Displays faculty members who are currently a proxy user on your faculty account. Accounts I Can Access: Displays faculty accounts that you have proxy access to. In the Access Granted to My Account section, click Add. The Add Access dialog box opens. Select the faculty to whom you wish to assign proxy access. All active faculty accounts are available. Select the expiration date for the proxy access. Add any notes if necessary. Click Save. If necessary, click the Edit icon to make changes to a user’s proxy access. Click the Delete icon to remove a user’s proxy access. This feature must be activated for your institution by DATA180. If you would like this feature activated, please contact us.